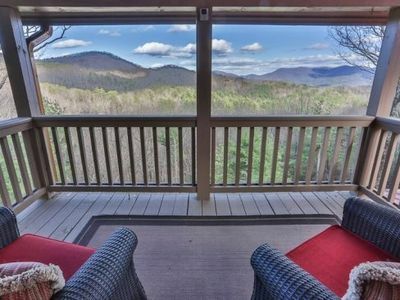 Tree-mendous is a pet friendly secluded tree top mountain hidaway for a romantic weekend, couples weekend, or family adventure, Tree-mendous is the perfect choice for a relaxing getaway. 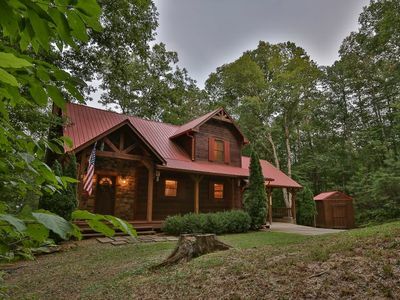 Easily accessed and located between Ellijay and Blue Ridge in a lovely Sisson log home community complete with a covered bridge as you enter the community. 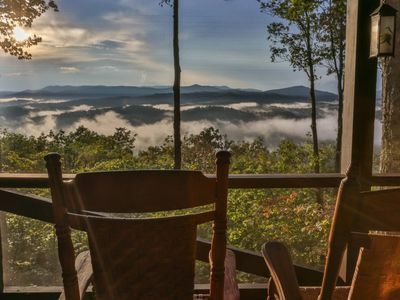 Arriving at this secluded retreat you will feel a world away from the hustle and bustle of everyday life. 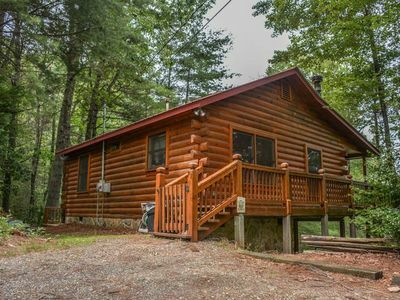 This cozy cabin with two bedroom suites and private baths is delightfully decorated down to every detail including custom furniture and fixtures with a rustic yet tasteful theme. Tree-mendous gets it's name because it is perched among the tree tops where you can practically reach out touch the leaves and feel one with nature. 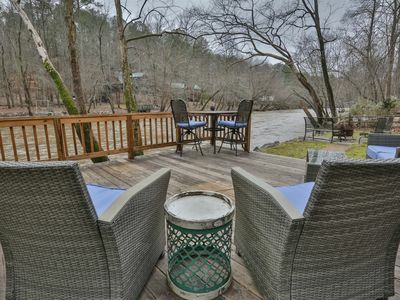 You will want to spend much of your time on the wrap around porch relaxing on the porch swing, lounging in the hot tub or rocking in one of the two wooden rocking chairs. 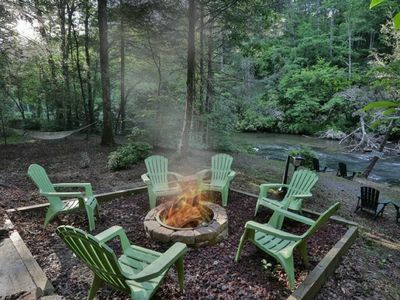 It is the perfect place to relax with friends, family, some good reading, and a beverage. Inside, Tree-mendous offers a cozy interior and every comfort you could want. 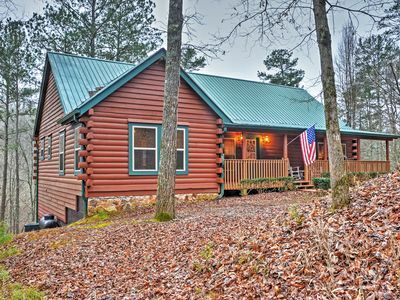 Neatly appointed with a comfortable leather sofa and loveseat, coffee table, end tables, and rustic yet elegant cabin decor. 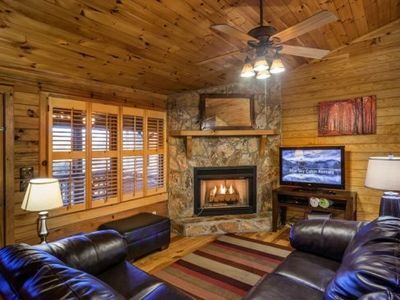 The family room has a beautiful gas rock fire place. Gather your friends and family around the wood dining table and enjoy a meal in the well equiped chef's kitchen. It is a pleasure to cook here because the kitchen has everything you need including a complete spice rack, mixer, blender, knife block, and anything else you desire. After dinner soak in the hot tub and enjoy a glass of wine while listeneing to the sound you seldom hear, quiet serenity. Let your woriees drift away as you gaze at the stars that appear in the night sky while soaking in the hot tub. If you prefer to stay indoors there is a flat screne TV, Blue Ray DVD player and a expansive DVD library, cable, wi-fi, and games to enjoy. 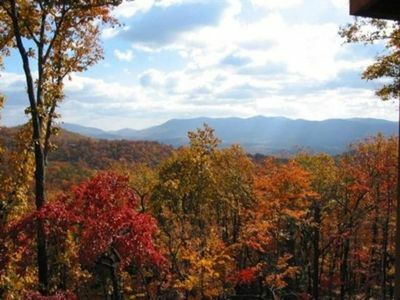 After an adventerous day exploring, hiking, swimming, fishing, boating, horseback riding, zip lining, or taking in the many local waterfalls you can retire to you bedroom with attached bathroom and get a restful night's sleep in the custom log bed with luxurious linens. Enjoy the professionally laundered plush towels when you awaken and have a shower and a hot cup of coffee. 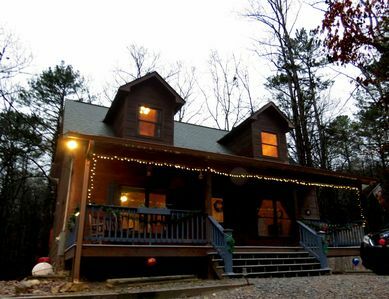 Tree-mendous is your private oasis in the woods to reconnect with nature, people, and the quiet part of yourself. 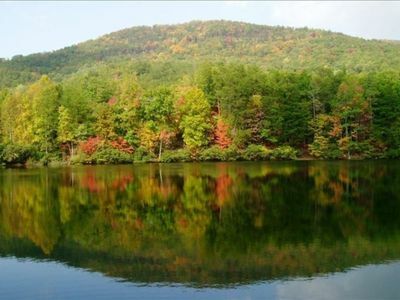 This is a place to make memories and return to time and time again. Sleeps 4, 2 Queen bedroom suites with private baths. 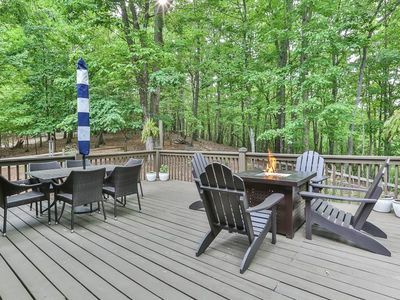 Outdoor- covered deck, hot tub, ceiling fan, porch swing, gas grill. Interior- wood tongue and groove, ceiling fans, tasteful rustic theme, tastefully appointed down to every detail. 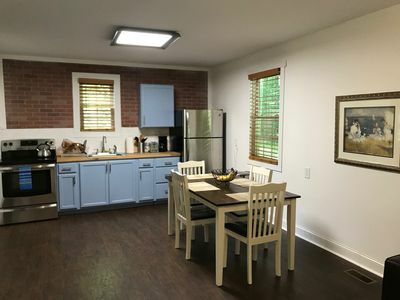 Kitchen- Fully equipped chef’s kitchen, electric stove, oven, kitchen utensils, microwave, toaster, coffee maker, blender, mixer, spice rack, and toaster. Dining Room- large rustic wood table seats 6 and opens into the living room. Media- Satellite, 32” HDTV, DVD, large movie library. 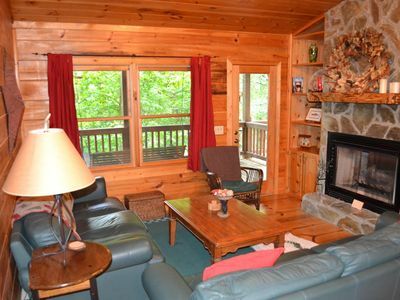 Family Room- Supple leather sofas, coffee table, end table, natural stone gas fireplace, and electronic candles. Bedroom- Front suite: Custom log Queen size bed, nightstand, closet, ceiling fan, lots of windows with private tree top view, romantic electronic candles. Bedroom- Back suite: Custom log Queen size bed, night stand, closet, chair, ceiling fan, windows looking into the trees. Bathrooms- Front suite: Private bathroom in the suite with shower tub. Back suite: Private bathroom in the suite with shower tub. 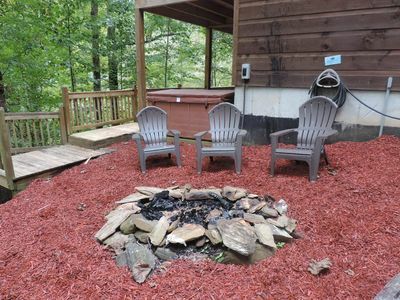 Outdoors: Large wrap around porch with swing, rocking chairs, gas grill, and hot tub. Laundry- Full size washer and dryer. 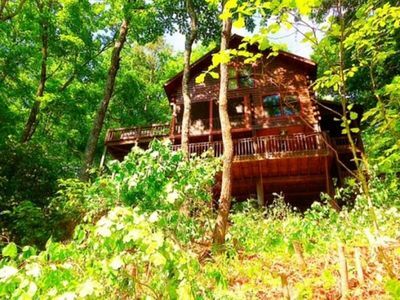 Tree top views creating total privacy. 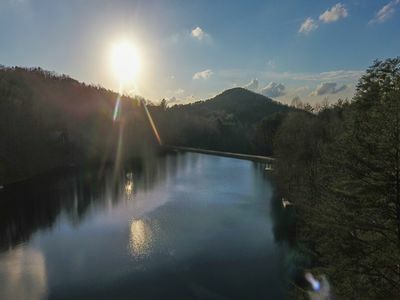 Close to Ellijay and Blue Ridge. 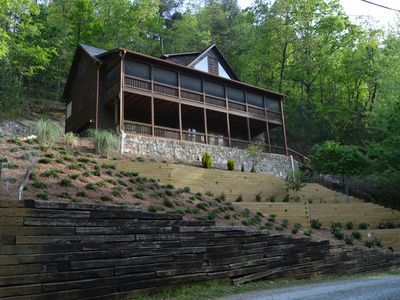 This cabin has easy access on gravel roads. 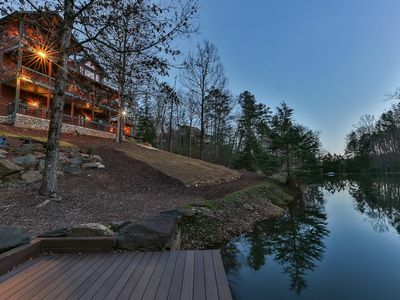 Lallybroch On The Lake is a welcoming retreat among the ambiance of Lake McClure. Non pet-friendly. Intro SPECIAL! From $99 per night!! 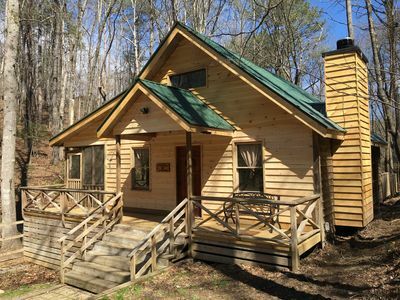 Brand new log cabin 2bdrm/2ba. Awesome View!